There’s a secret that Rose-Marie has been trying to keep away from us for quite some time now. In fact, Rose-Marie tells me that it’s the most frequently asked question by her fans, after they’ve seen her in concert; but let’s not divulge that information for now - it’s not something that Rose-Marie cares to broadcast to the world in a hurry. 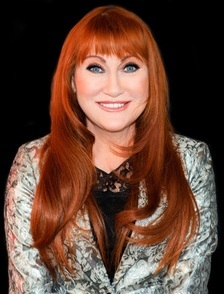 Rose-Marie, with her flaming red hair, powerful voice and burning love for the stage has produced over 19 albums, all of which have gone gold and platinum in the UK and Worldwide. Born in Newry, Northern Ireland, she grew up on a farm with her parents and siblings and knew from an early age that she wanted to be a singer. The cows she milked on the farm were a captive audience for Rose-Marie and despite her parents wanting her to get a ‘proper job’ she decided to pack up and take her chances in London. Once there, she appeared on ITV’s ‘Search for a Star’ from which her big break came, especially when producers saw that she could not only sing but also had a wicked sense of humour and from thereon in, it would seem that she has never stopped working, selling millions of records. I catch up with Rose-Marie as she embarks on her tour which celebrates her 30 year career in show business and I ask her whether, looking back, if there would be anything that she would change in that time. She replies in that wonderful throaty Northern Irish accent, “No I wouldn’t really because my career’s been very successful and I’ve had great health and so I’ve no regrets at all. I think you’re blessed if you have good health.” She continues, “I’ve gotten to do everything in my career - acting, musicals, concerts, so I feel very lucky and I’ve got amazing energy!” This energy, she tells me comes from power walking every day and the occasional trip to the gym. Such was the acting bug that Rose-Marie decided to go over to the States for 5 years where she enrolled in the Ivana Chubbuck School of Acting which boasts such alumni as Halle Berry and Brad Pitt. It was whilst in LA that Rose-Marie befriended film idol, John Travolta. “Oooh yes!” she exclaims with delight. “John came to see one of my shows in LA and he loved the Irish humour that I put in to the show. He was just so lovely. It was so nice of him to just to come to the concert but then he set me up with a couple of agents out there. I did quite a few auditions and I did get a small part in one sitcom. He was very kind like that.” The sitcom was called ‘All My Days’ and despite being just a cameo appearance, Rose-Marie says it was a great experience. “And of course I had the great pleasure of working with Johnny Cash - he was the most amazing man I’ve ever met in my life, he was just fantastic and Tammy Wynette - all the greats like that.” she tells me, dropping in a few more names! Does she do all her Facebook and Twitter updates herself? “I think it’s important to keep in touch with your fans. I would never have anybody do it for me because I have a lot of sayings that I use that my fans know and so I like to do it personally. It can be time consuming sometimes but I think it’s worth it. It’s been so lovely chatting to Rose-Marie and as I thank her for her time, she leaves me with a “Thank you dear heart. Bless your heart, all the best to you, take care of yourself.” What a gal! She’s definitely my new favourite person. If you’d like to get all romantic with Rose-Marie as well as having what promises to be a truly fun night out you can book to see her concert at www.southendtheatres.org.uk or call the box office on 01702 351135.